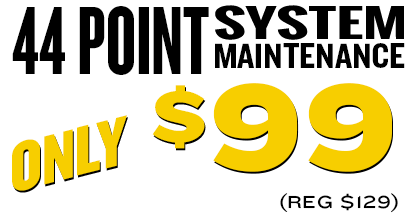 Save $30 on Our 44 Point Heating & Air Conditioning Maintenance! Falling in love with your home’s HVAC system is easy. There’s nothing like being able to relax in climate-controlled luxury no matter what the weather is like. To keep your home’s air-conditioning and heating system operating correctly, yearly maintenance is essential. At Howard Air, we take high-quality service very seriously from start to finish. No Breakdown Guarantee: You’re guaranteed excellent results after our maintenance services or repairs. If any kind of problem appears, our technicians will return at no cost to you. NATE-Certified Technicians: NATE certification is the highest level of excellence in the world of HVAC. All of our technicians are NATE certified to ensure nothing escapes their notice. At Howard Air, we want to make it as easy as possible for you to enjoy sweet comfort all year long. If you suspect your HVAC system, air-conditioner, or heating system isn’t working properly, there’s no better time to have our experienced techs check it out. If we find that major repairs are required, we’ll waive the entire diagnostic fee. That’s a savings of almost $90! It’s our way of hoping you have an incredible year. Knowledgeable technicians: Our service teams have extensive experience with repairs for all brands, including Carrier, Ruud, York, Goetti, and Rheem. State-of-the-art technology: Thanks to our diagnostic tech, we don’t have to waste time guessing what the problem is. Identifying issues quickly allows us to perform repairs in the shortest amount of time possible while maintaining the highest standards of quality and professionalism. Amazing reputation: There’s a reason we have a Better Business Bureau A+ rating and hold the top rating for Arizona on Angie’s List. We prioritize great service you can trust over all else, and our customers notice. Despite your best efforts, the time can come when an older HVAC system needs replacing. No matter what the reason why you’re in the market for a new home comfort system, we’ve got some great news for you. Right now, if you install select Carrier home comfort systems in your home, you can be eligible for amazing rebates of up to $1,650! That’s huge savings just for choosing to upgrade to a top-quality HVAC system. The perfect HVAC system for your home depends on a number of factors, such as total square feet, home construction materials, and system output. You don’t have to make any of these decisions alone. Our experts provide excellent recommendations to give your home the best results. Professional installation is essential for warranty considerations, maximum energy savings, and optimal performance. Contact our heating and air-conditioning experts at Howard Air today to take advantage of these incredible specials paired with our signature customer service and experience. Our factory trained and NATE certified technicians will precisely tune your AC system back to factory specifications to ensure peak performance‚ efficiency‚ safety and warranty compliance. Yearly maintenance is recommended by the U.S. Department of Energy and local utility companies and required by your equipment manufacturer in order to keep your warranty valid.